The beauty industry has experienced a radical shift in the past five years, and I have been covering it all in my Evolution of the Beauty Industry Series. No industry was spared, and all businesses had to adjust the way they market to people. Traditional marketing became obsolete once social media invaded single facet of our lives. Millennials were leading the charge with fresh perspectives, ideas, values, and ambitions. The beauty industry took a particularly huge hit, as the rise of influencers and digital mediums began encroaching on age-old ways. Social media’s sudden dominance threw a wrench in well-oiled engines, and famous beauty giants —beloved by this generation’s mothers— found themselves in a precarious position. The category was shifting and adapting was vital to survival, but getting a colossal machine in gear can be challenging. Visual social channels like YouTube and Instagram were the primary conduits for change by giving a voice to unlikely experts. For the first time ever, anyone could rise to stardom and become an authority on a specific topic with the mere click of a button. Which was the logical outcome considering the category’s entire focus revolves around aesthetics and peer recommendations. So here we were in the midst of a cultural transformation, with social media in the lead and visionaries in the front seat. The beliefs and values with which purchase decisions are made are changing the marketing MO. Traditional forms of advertising were beginning to be (rightfully) considered opaque and out of touch, and there was an increasing disconnect from the messaging. Young people wanted something different they could relate to, and platforms like YouTube and Instagram provided a podium to be heard. These young consumers were able to take back some power from the companies thanks to having a new stage for communication and self-expression. By default, they changed how the world operates. In fact, the customer’s role today is dramatically different from what it was before Instagram came into our lives. The platform has been instrumental in breaking the boundaries between brands and people, allowing for outside voices to be heard. It created a dialogue and empowered young entrepreneurs to fill newly discovered voids in what had previously seemed like an oversaturated segment. Innovative, modern-day cosmetics brands have sprouted in the past few years to fill the previously untapped gap. One where transparency rules, authenticity is a core principle, and communities are not only formed, but are also highly valued and constantly interacted with. This new media era has essentially forced older companies to reevaluate their center of gravity while allowing new ones to blaze a trail with relevant messaging that resonates with this generation. A perfect example of this is when Loren Ridinger-Creative Director & Founder of Motives Cosmetics decided to ask a handful of Instagram artists to try her products and share their thoughts. She really was one of the first companies to recognize the value of this decision and it grew their followers so quickly that they became one of the fastest growing social media brands. In a social media world, consumers are savvy, demanding, and have a lot of leverage. Brands are conscious, honest, serving, clever, and innovative. The beauty industry has developed an ecosystem where a social campaign and the best content marketing strategy can elevate a business to cult status. This once unorthodox way of operating has become the only course of action for today’s top makeup brands and skincare super players. A sector that was once deemed overcrowded has now been invaded by a new crop of independent brands that isn’t adhering to the defunct rules of yore. Rebelling has driven their success, with social as a primary propaganda platform. New beauty businesses are using Instagram as a launching pad as well as an ongoing brand vehicle — a strategy that has proven to be quite effective for growth and hype. It’s a channel on which they can share their values and story, build a brand world, create a journey, and, more importantly, establish a dialogue with their community. Vegas_Nay was named the most popular makeup artist and fashion entrepreneur on Instagram in 2015. Giannopolos discovered her talent back in high school. She became the go-to glamour girl for her classmates around prom and homecoming seasons. Soon after, she began booking clients, like bridal parties and models. Giannopoulos mastered the art when she became one of 10 students selected to train under high-end fashion mogul Roberto Cavalli’s design team in Florence, Italy. However, it wasn’t until Giannopolos began blogging and posting on Instagram that she gained social media success. She now has over 7.5 million followers and her own eyelash and makeup line. She began producing online beauty content in 2010 began producing on-line beauty content with a modest goal: to become the biggest beauty blogger in the Middle East & launch a namesake brand there. And dreams do come true…since launching Huda Beauty, the once finance exec has become one of the most popular global beauty influencers, with more than 20 million followers on Instagram. She is ranked #1 on the “2017 Influencer Instagram Rich List”, earning $18,000 for each post of sponsored content. She was also declare one of the “Ten Most Powerful Influencers In the World of Beauty” by Forbes Magazine. You are going to see more companies investing in becoming a direct to consumer platform and in partnerships to drive conversations that are happening on social media and developing technology to go ecommerce to retail while keeping customer information. 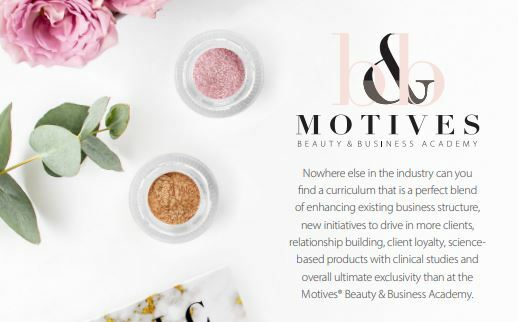 Our new Motives Beauty & Business Academy capitalizes on all of this and other industry changes for Salons & Spas!! Don’t wait to start capitalizing on these evolutions. Let me help!! Are You Really Capitalizing on this BILLION DOLLAR Industry?